If you've ever had to dig up stubborn roots before, you’ll know how difficult the task can be. Generally speaking, the standard garden shovel doesn’t provide enough in the way of power which leaves us needing pry bars, hatchets, and who knows what else. Most of the time, we go looking for something a little more…and now we could have it with the Radius Garden Root Slayer Shovel. Winner of the Most Innovative Garden Tool award at the 2017 Green Thumb Awards, the Root Slayer uses an ergonomic O-handle grip and this is now patented by the brand. Compared to a D-handle, research suggests this provides four times more grip and this is already a superb advantage to choosing the product. In addition to this, the product has actually been certified to be 150% stronger (at least) than standard gardening tools and this is why it provides the power we need to get into the dirt and under the roots. In terms of features and numbers, you get a blade that’s 2.5mm thick which contributes to a tool that’s nearly 45 inches tall overall. With a coarse-toothed saw on the shovel, it shouldn't ever get clogged up by dirt and better durability is provided by the longer ferrule. In total, it comes in weighing five pounds and the black and red colours set it apart from the rest. Although we’ve touched upon some of the differences, why should you choose this model over any other? Check out the points below to find out. First and foremost, you have numerous tools all thrown into one and the manufacturer has done it right. Without requiring several tools which take up space in the shed (as well as creating space in your bank account), you have everything you need with one tool. With the D-shaped handles that seem to have been around for a significant amount of time, the emphasis and stress is placed on the wrists. Over time, this causes pain and can lead to more severe injuries if you use a shovel often. With the Radius Root Slayer, you have an O-shaped handle and this allows you to test different grips and find the one that suits you. If we compare the Root Slayer to a traditional root removal tool, the saw teeth and blade are much stronger with this one which leads to greater results year after year. With a coarse-toothed formation, it removes the issue of clogging and becomes more effective yet again. 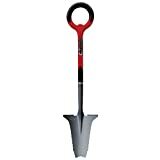 For beginners and experts alike, the Radius Root Slayer shovel is simple to use and it even works well within tight spaces thanks to its compact design. With greater accuracy, strength, and a sharp blade, why have three tools taking up space when you only need the one…one that seems to do the job better regardless!